The year 2018 promises to be an exciting one. The following is a just a taste of the developments this column will cover in the coming months. Barbara Durrant, Ph.D., and her team of reproductive physiologists at the San Diego Zoo Institute for Conservation Research, recently received a grant to fund the acquisition of equipment and supplies for several rhino tissue preservation kits. Ultimately, these kits will be distributed to zoos in the United States with rhinos, and to research staff at several African national parks and game preserves. As a part of this effort, working with Durrant's team, the Academy is producing a short training course. The course is being designed to be viewed on any mobile device in the field, anywhere in the world. This is our first example of what one might call "just-in-time training." Tissue preservation is time critical, and minutes can make all the difference. The course will walk researchers and rangers through a short, systematic process for how to use the kit's equipment and supplies. Barbara Durrant's goal is to teach others how to retrieve and preserve rhino ovaries and oocytes. Tissue that would otherwise be lost will have the potential to be preserved and transported to a lab or university for cryogenic preservation. The resulting tissue banks may one day become critically important to future rhino conservation. Shifting gears, we move to the topic of rattlesnakes. The San Diego Zoo Safari Park's eastern boundary nestles next to thousands of acres of coastal sage scrub habitat. Rattlesnakes are an important part of this ecosystem, and two of the seven species of rattlesnakes occur naturally at the Safari Park. Occasionally, Safari Park rangers or keepers will need to safely capture and relocate a venomous snake. An upcoming column will share some fascinating details associated with this, and related safety training that uses the Academy's new Course Creation software tool. Your safety training needs may be a bit different from training for safely collecting a live rattlesnake, but the same Course Creation software used to create this course is now available to you and your institution. You will want to be sure and look for this future column. 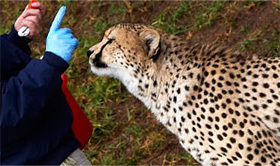 You might be surprised to learn that Academy courses are used for other purposes besides training zoo and aquarium staff. During the last few years, the Academy has developed strong relationships with various universities and colleges. Today, our courses are also being used as supplemental curriculum by Michigan State University, the University of Arizona, Otterbein University in Ohio, and Moorpark College in California. Professors report that Academy courses are influencing and informing future biologists, conservationists, and animal care professionals. In fact, the Academy has enjoyed working with several interns from Michigan State, who have been helpful in editing some of the video case studies you have seen in our Animal Care Training professional series of courses. We anticipate deeper and broader academic relationships as we move forward with you in shaping the future of zoos, aquariums, and field conservation. Katie Licht, academic specialist in the Department of Integrative Biology at Michigan State University, gave the Academy a nice testimonial—and you can see it here. For questions, please contact: Gary Priest, curator of animal care training, San Diego Zoo Global Academy, at gpriest@sandiegozoo.org. The National Aquarium in Baltimore is part of the Academy's collaborative learning environment! Fred Shaffer, manager of staff training and development at the Houston Zoo; and Jon Prange, director of San Diego Zoo Global Academy, are scheduling conference calls this year to discuss training opportunities online, at facilities, and in our industry. This is an opportunity to leverage the Academy platform and training opportunities via regular conversations and increased collaboration. Our next conference call is scheduled Wednesday, February 28, at noon Pacific standard time (PST). Please join us if this sounds like it could be of interest to you and your organization. For more information about this meeting, please contact Jon Prange at jprange@sandiegozoo.org. Please join us for the Administrator's Users Group Webinar, hosted by Academy partner CypherWorx. The next webinar is Wednesday, January 17, at 11 a.m. PST. In the course of its administration and enforcement of the U.S. Animal Welfare Act (AWA), the U.S. Department of Agriculture (USDA) Animal and Plant Health Inspection Service (APHIS) Animal Care unit generates a lot of activity and produces an abundance of written and electronic information. Key activities and resources include licensing, facility inspections and outreach, enforcement actions, proposing and reviewing regulatory changes, and, increasingly, providing informal guidance to assist in complying with the AWA. The Animal Welfare Inspection Guide, a wonderful resource for inspectors as well as conscientious zoological professionals, as "a tool to maintain adherence to the regulations and standards . . . a way for our stakeholders to deepen their understanding of how the Animal Welfare Act is put into everyday practice": https://www.aphis.usda.gov/animal_welfare/downloads/Animal-Care-Inspection-Guide.pdf . "…are guidance documents that highlight ways for us to: encourage regulated entities to be even more proactive when identifying and correcting non-compliances under the Animal Welfare Act; and enhance the communication between our inspectors and attending veterinarians for the betterment of the animals' well-being." Thankfully, for dedicated professionals like you, such a prominent acknowledgement that these are not "formal requirements" justifies even closer examination of these Tech Notes, including two recent and very significant ones. Think of it like this: the federal agency having primary jurisdiction over animal welfare (relating to those activities and species covered under the AWA) has laid out recommended approaches and practices for complying with the law and helping animals. Great! Yes, even though not formally required, these establish an informal measure of AWA compliance and good practices. At the least, these Tech Notes should be understood, adopted, and followed, or used to develop alternative, effective good practices relating to the underlying requirements. Any of these approaches (as contrasted with ignoring agency guidance until something happens to trigger a belated review) makes you, your organization, and your animal-related efforts better. And, in the event you question agency guidance, respectfully presenting any concerns and alternative suggestions to the agency might further advance animal welfare nationally. This is how zoological, accrediting/certifying, and professional organizations build even better collaborative relationships, focused on constructive action to better serve animals. ". . . describes a new incentive program that recognizes licensees/registrants who routinely (self) monitor their activities and take appropriate and timely action to address noncompliant items." (Available at https://www.aphis.usda.gov/publications/animal_welfare/2017/ac-tech-note-incentives-animal-welfare-act-compliance.pdf.) This encourages maintaining compliance, timely identification of potential non-compliances, immediate corrective action (including measures to prevent reoccurrence), and prompt self-reporting. The Tech Note indicates self-reporting should be within five days, and should include information specified in the document. Meeting the criteria set forth in the Tech Note may allow for a matter, including a certain non-compliance, to be addressed and reviewed without being written up in a formal inspection report. The portions of Excellence Beyond Compliance addressing organizational framework, inspection preparation and follow-up, and serious incidents provide useful insights on good practices to make the most of the opportunities afforded via this groundbreaking Tech Note. ". . . provides helpful information so licensees/registrants can better fulfill the regulation requiring them to assess the health and well-being of their animals every day." (Available at https://www.aphis.usda.gov/publications/animal_welfare/2017/ac-tech-note-daily-observation.pdf.) The agency suggests means for consistently and effectively observing and assessing animals including their physical attributes, behavior and environment. See also, Excellence Beyond Compliance, "Observation and monitoring of animals, and communications regarding veterinary treatment." In addition to the above Tech Notes and others available for review on the agency website, the agency has been prolific in launching other new initiatives. One is exploration of a potential revision regarding an often criticized license renewal process, where licenses are all but automatically renewed, even when there are recent open serious non-compliances. The agency's Federal Register notice is located here https://www.gpo.gov/fdsys/pkg/FR-2017-08-24/pdf/2017-17967.pdf and comments can be reviewed here: https://www.regulations.gov/docketBrowser?rpp=25&so=DESC&sb=commentDueDate&po=0&dct=PS&D=APHIS-2017-0062. Another effort is an evaluation of incorporating professional association accreditation and certification into the determination of inspection frequency, an idea with interesting potential. To those weighing in on the upcoming review process, here's a suggestion. In advocating for such use of these third-party reviews, find ways to build upon those reviews so that exceeding AWA compliance and ongoing enhancements in animal welfare are the highest priorities, and there are means in place to continuously improve animal welfare. Finally, the agency's 2018 activities and accomplishments have been summarized in a stakeholder announcement, report and poster available at https://content.govdelivery.com/accounts/USDAAPHIS/bulletins/1cf1c91, https://www.aphis.usda.gov/publications/animal_welfare/report-2017-accomplishments.pdf, and https://www.aphis.usda.gov/publications/animal_welfare/pos-2017-accomplishments.pdf, respectively. Being aware of these underappreciated Animal Care guidance documents—and better understanding them and potential practical applications, and other agency efforts—opens up ever more ways for us to grow to be the best professionals and community of caregivers possible. For us, and the animals we love, it is well worth the effort. You had better live your best and act your best and think your best today; for today is the sure preparation for tomorrow and all the other tomorrows that follow. For more information on the AWA please see my article, Animal Welfare Act: Good Practices to Advance Animal Interests and Well-Being, published in the Fall 2017 edition of the American Bar Association, Tort Trial and Insurance Practice, Animal Law Committee Newsletter, which is available upon request to info@excellencebeyondcompliance.com. ©2018 James F. Gesualdi, P.C. The opinions expressed herein are solely those of the author. This is not, nor should it be construed as, legal advice. Welcome to 2018. Where do the years go? I still vividly remember the lead-up to the new millennium in 2000, and the "millennium bug" that was going to cause world collapse, with planes falling out of the sky and financial services collapsing. None of that occurred—and here we are, 18 years later. Fish are the most amazing group of vertebrates on the planet. There are over 30,000 species, which is more than all the other vertebrate species combined. They live in all aquatic ecosystems on the planet. How do they survive in this aquatic environment? Through a process called osmoregulation. Osmoregulation is the active regulation of the osmotic pressure of an organism's body fluids, to maintain the homeostasis of that organism's body water. Remember that homeostasis refers to a constant balance state or equilibrium of the body. Osmotic pressure is the pressure that must be applied to a solution to prevent the inward flow of water across a semi-permeable membrane—in this case, mainly the skin, gills, and intestinal tract. Water can contain a wide variety of salts (the ions). The amount of salts (the salinity) can range from almost zero in a freshwater forest stream; to seawater, which contains salts at 35 parts per thousand (ppt); to hypersaline desert ponds, which can be greater than 100 ppt. Fish have thus developed a whole series of osmoregulatory mechanisms for coping with these wide-ranging salinities and still maintain homeostasis. The osmotic concentration of fish blood is intermediate between that of fresh water (0 ppt) and seawater (35 ppt). It is almost the same as humans, and ranges between 8 and 10 ppt. One simple example of how osmoregulation can affect us is when you have a prolonged bath or swim in fresh water and you get wrinkles on your fingers. This occurs primarily because your skin absorbs water (secondary blood vessel changes can also occur). includes Magnesium (Mg2+), Calcium (Ca2+), Sulphate (SO42-), and Carbonate (CO32-). There are three organs of the fish body (gills, intestinal tract, and kidneys) that are actively involved in maintaining osmoregulation, and that have different roles in freshwater versus seawater fish. In the next newsletter, we will look at the specifics for freshwater fish. 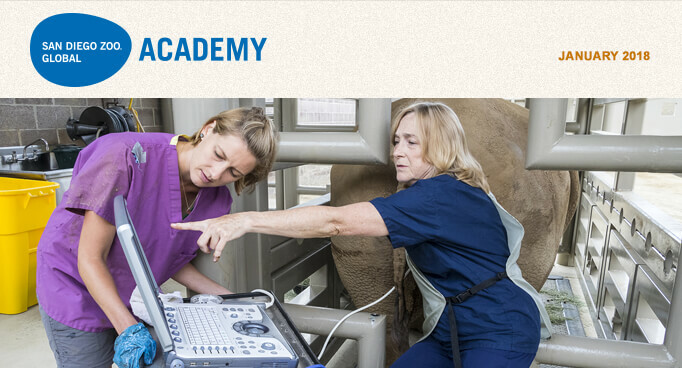 The San Diego Zoo Global Academy is excited to share an additional Academy subscriber benefit regarding our collaboration with The Aquarium Vet: as an Academy subscriber, you are now entitled to a discount on the e-quarist™ courses. We are also happy to offer one of our free monthly webinars. For more information about the SDZGA discount, or anything about the e-quarist™ course, including next month's free webinar, please contact katrina@theaquariumvet.com. Visit the Aquarium Vet website at theaquariumvet.com.au. The Academy's collaborative learning environment is already "hatching" innovative ideas: let's continue to make it easier to do. You get the idea—or, should we say, you've got the ideas—so, let's collaborate on innovation! Please share your online training ideas at: sdzglobalacademy@sandiegozoo.org.